A rare moment for Winchester collectors occured during the 5th Annual THCKK Meet (http://www.thckk.org/) in 2005. A rare can of Winchester tennis balls, heretofor sealed in factory condition, was opened, revealing to collectors the appearance of 3 genuine Winchester tennis balls. Winchester experts disputed the existance of Winchester tennis balls. Tennis collectors had a suspicion of their existence, especially since it was known that Winchester made tennis racquets. 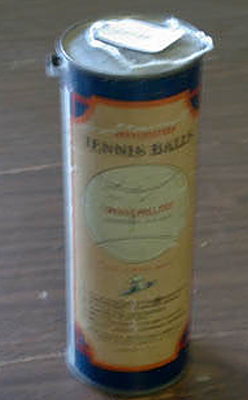 One ball was traded for a 1920s Winchester percolator (valued at $2,500), one sold to a Winchester collector, the can’s owner kept the can and remaining ball. (He later sold them to the collector that had purchased the second ball). Special thanks to THCKK (http://www.thckk.org/) for allowing VintageTennisBalls to share this story and photos with our visitors. YES!! 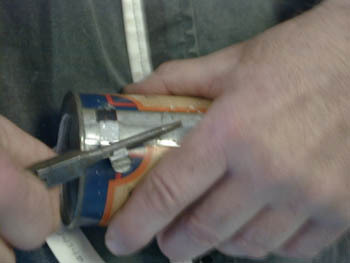 the can was still pressurized and a burst of air from circa 1930 swished into the room. 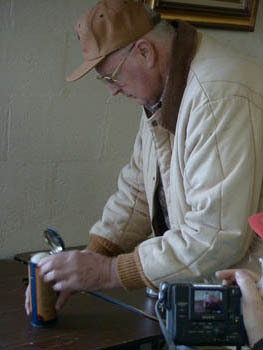 Winchester collector opens can at 5th Annual THCKK Meet.